A train trestle between the Diridon and Tamien Caltrain stations caught fire early Wednesday, according to fire officials. Kris Sanchez reports. 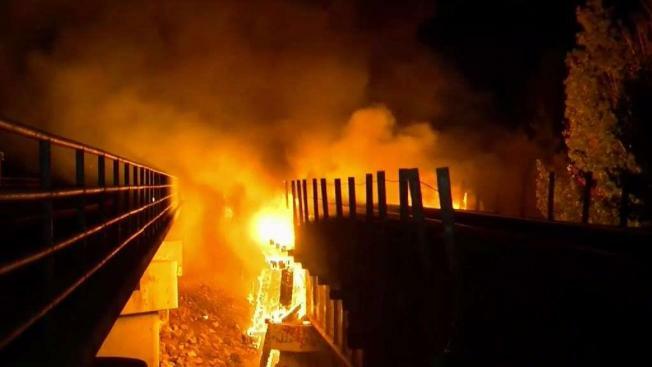 A train trestle in San Jose used by Union Pacific and Caltrain caught fire early Wednesday, according to officials. Roughly 200 feet of Union Pacific's wooden trestle located next to Mclellan Avenue was damaged after the fire ignited around 3 a.m., San Jose Fire Department Cpt. Tremaine Thierry said. Trains were later cleared to single-track through the area after crews gained control of the flames, according to Caltrain. Caltrain said delays would be minimal because its trains have recently been single-tracking in the area due to the Los Gatos Creek Bridge Replacement Project, according to the transportation agency. Union Pacific crews plan to inspect the trestle and tracks throughout the morning. It is not clear when the trestle and rail line will reopen. A cause for the fire was not immediately known, but Thierry noted that fire crews recently battled a brush fire in the same area. "This has been a problem area for fire due to the high population of homeless people that live in this area," he said.